After years of watching Fringe, I hadn’t noticed the coincidence – that the series of supernatural events happening in the show is called “the pattern.” And my kid said, “Mommy, you should do a pattern for something with fringe on it.” Um, yes, I should. 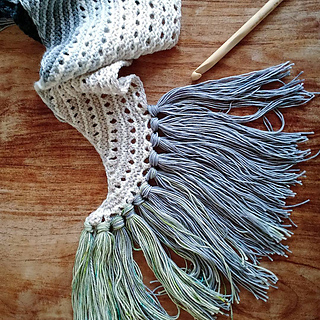 A shawl with a simple repeating pattern and outrageously beautiful fringe is the result. Choosing yarns for this shawl is a creative experience that is deeply rewarding and really enjoyable. I found adding the fringe to be a meditative stress-busting activity. 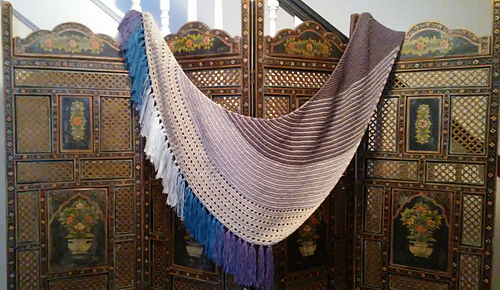 And the shawl is so gorgeous, I have it hanging up as art. 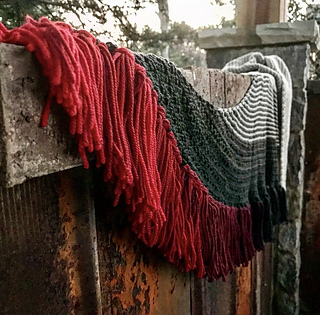 The shawl body is mostly Garter stitch stripes, ending with a unique 12-row eyelet stripe pattern. 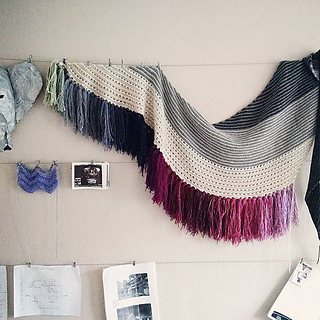 Keep in mind that the body of the shawl is a progression of colors that will work together with your fringe. 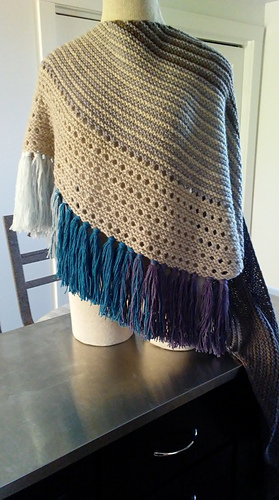 For that reason, I suggest neutrals in a dark-to-light progression, but another option would be a neutral fringe fade with a more colorful shawl body. Blue Sky Fibers Woolstok is a light-Worsted wool with 123 yards per 4 oz. skein, and is affordable for many budgets. A great new basic wool! As shown, A: Midnight Sea, 1 skein; B: Cast Iron, 2 skeins; C: Storm Cloud, 2 skeins; D: Grey Harbor, 1 skein; E: Highland Fleece, 1 skein; F: Drift Wood, 1 skein. When substituting yarns, choose a progression of neutral colors from dark to light, with a total of about 850 yards/777 meters. Another great yarn for basic wool projects is Cascade 220, or you can use any lovely wool. Scraps in a color progression make a gorgeous one-of-a-kind artwork. Fade kits or gradient sets will work great, too. You will need about 200 grams total. 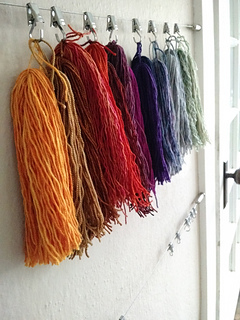 you will need enough of each color to make about 100 strands, each 14” long. This is a guideline only. Don’t give up on scraps that you want to incorporate if you don’t have that much. Try options and see what happens! sample uses 14 colors, blending from pale green, through grays, blues, purples, a variety of pinks, and ending on an electric lavender.